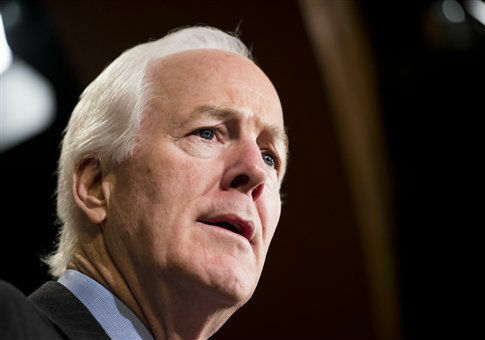 Sen. John Cornyn (R., Texas) on Monday introduced legislation that would require states to recognize gun-carry permits from other states. The Constitutional Concealed Carry Reciprocity Act of 2017 aims to make concealed carry permits more like driver's licenses, proponents argue. Instead of a patchwork of reciprocity deals from state to state, Cornyn's bill would make most state-issued permits universally accepted. "This bill strengthens both the constitutional right of law-abiding citizens to protect themselves and the power of states to implement laws best-suited for the folks who live there," Cornyn said in a statement. "This legislation is an important affirmation of our Second Amendment rights and has been a top priority of law-abiding gun owners in Texas for a long time." Currently, each state and jurisdiction decides which states' concealed carry permits it will honor. Often this takes place on a rolling basis and changes from year to year and administration to administration. Some states, like Virginia, honor permits from every state. Other jurisdictions, like Washington, D.C., don't honor permits from anywhere else. Gun rights activists have decried the current system as confusing and hazardous for law-abiding gun owners. "The current patchwork of state and local gun laws is confusing and can cause the most conscientious and law-abiding gun owner to run afoul of the law when they are traveling or temporarily living away from home," said Chris Cox, head of the National Rifle Association’s Institute for Legislative Action, in a statement. "Law-abiding citizens should be able to exercise their fundamental right to self-defense while traveling across state lines." Rep. Richard Hudson (R., N.C.), who introduced similar legislation in the House in January, praised Cornyn's bill. "Senator Cornyn has long been a champion for our Second Amendment rights and I'm pleased to see him continue his strong leadership on national concealed carry reciprocity," Hudson said in a statement. "With a groundswell of support from Americans across the country and a pro-Second Amendment president, I believe we can make national concealed carry reciprocity a reality." There two pieces of legislation appear to differ on one point, however. Hudson told the Washington Free Beacon in January that his legislation would require a state to honor all nonresident permits from other states, even if it is held by one of its own residents. In other words, this provision would allow someone who lived in a state like Hawaii, which issued zero concealed carry permits last year, to legally carry in Hawaii by obtaining a nonresident permit from another state. Cornyn's bill does not include this provision, according to his aides. Under Cornyn's bill, if individuals are allowed to carry in their home states then they are eligible to carry in other states. Individuals will not be free to obtain concealed carry permits from other states to use in their home state. "The legislation allows a person to use a nonresident permit to carry in their home state so long as their own state recognizes the permit as valid," one Cornyn aide said. Both bills are now awaiting hearings. This entry was posted in Issues and tagged Concealed Carry, Guns. Bookmark the permalink.